St. Martin's Press, 9780312611576, 400pp. A unique and sweeping debut novel of an American female combat photographer in the Vietnam War, as she captures the wrenching chaos and finds herself torn between the love of two men. On a stifling day in 1975, the North Vietnamese army is poised to roll into Saigon. As the fall of the city begins, two lovers make their way through the streets to escape to a new life. Helen Adams, an American photojournalist, must take leave of a war she is addicted to and a devastated country she has come to love. Linh, the Vietnamese man who loves her, must grapple with his own conflicted loyalties of heart and homeland. As they race to leave, they play out a drama of devotion and betrayal that spins them back through twelve war-torn years, beginning in the splendor of Angkor Wat, with their mentor, larger-than-life war correspondent Sam Darrow, once Helen's infuriating love and fiercest competitor, and Linh's secret keeper, boss and truest friend. Tatjana Soli paints a searing portrait of an American woman's struggle and triumph in Vietnam, a stirring canvas contrasting the wrenching horror of war and the treacherous narcotic of obsession with the redemptive power of love. Readers will be transfixed by this stunning novel of passion, duty and ambition among the ruins of war. Tatjana Soli's short stories have been widely published, nominated for the Pushcart Prize, and twice cited in the 100 Distinguished Stories in "Best American Short Stories." "The Lotus Eaters," her debut novel, was a "New York Times" bestseller and Editors Choice and a finalist for the "L.A. Times" Book Award. Born in Salzburg, Austria, Soli attended Stanford University and the Warren Wilson M.F.A. program. She lives in Orange County, California. 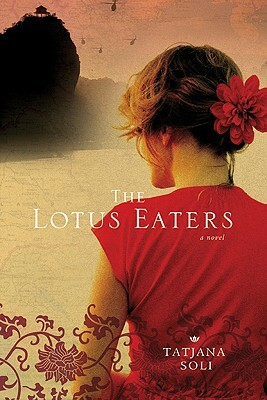 Soli pulled the novel's title, The Lotus Eaters, from an episode in Homer's The Odyssey and uses Homer's description of the land of the lotus-eaters as the novel's opening epigraph. What connection do you see between Homer's lotus-eaters and the main characters of this novel? What, if anything, in this novel acts like the lotus described by Homer, so powerful and seductive it causes one to abandon all thoughts of home? Does each character have a different "lotus" that draws them in? How does the title illuminate the main themes of the novel? The novel begins with the fall of Saigon, and then moves back in time twelve years to the beginning of the war. How do you think this structure contributed to your experience of the novel? Did this glimpse of Helen in 1975 influence how you related to her character at earlier points in her life? Did knowing the outcome affect your judgment of her actions and the action of those around her? Helen makes a pivotal decision at the end of Chapter 1 — to send Linh on the plane and stay behind to “see it end.” Why does she make this decision? How did you feel about it? Did your feelings about it change over the course of the novel? What does Helen think of Vietnam and the Vietnamese people when she first arrives in Saigon? How do her feelings evolve throughout the novel? How does this evolution affect how she comes to view the war and her role in it? In Chapter 3, Darrow says, “The cool thing for us is that when this one’s done, there’s always another one… The war doesn’t ever have to end for us.” Why does he say this to Helen? What does it show about how Darrow views the war and about Darrow himself? When Helen repeats these words back to him in Chapter 11, how has their meaning changed? In Chapter 19, Helen believes that “violence had poisoned them all...” In what ways are Darrow, Helen, and Linh poisoned? What, if anything, keeps each of them from being destroyed by it? Throughout the novel, Helen finds herself in love, and loved by, two very different men. How would you characterize each of her relationships? Did you prefer Helen in one relationship over the other? What are each relationship’s strengths and weaknesses? Which man do you ultimately believe is Helen’s great love? Mark Twain said, “Courage is resistance to fear, mastery of fear, not absence of fear.” Bravery and courage are frequently mentioned in the novel. In what ways do the various characters display these traits? In what ways do they fail? What do you think the future holds for Helen at the end of the novel? For Linh?